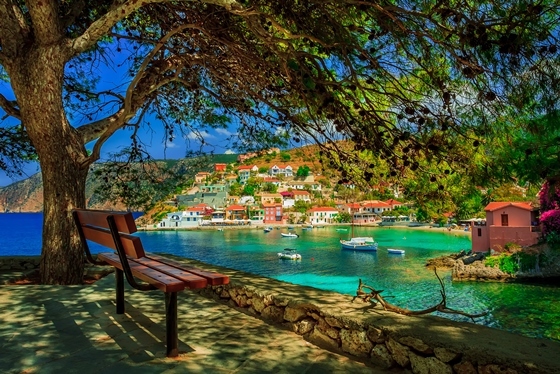 Equipped with the Aktion airport, Preveza on mainland Greece is just 25 minutes form Lefkas and is one of the busiest and largest areas for yacht sales. It only takes three hours to fly to Aktion airport from London, making it incredibly accessible for even the busiest yacht buyer. The Ionian Marina, Aktion Marina, and Cleopatra yards in Preveza have a high concentration of yachts and boats. During the off season, these yachts and boats for sale are brought ashore, making them easier to view and sell. The Williams & Smithells brokers do extensive work in Preveza as well as Lefkas, but they are not the only boat buyers or sellers in the area. The names Feeling, Moody, Oyster, Northshore, Bowman, Wauquiez, Bavaria, Westerly, Beneteau, Jeanneau, Elan, and Dehler, all have holdings in Preveza, as do a range of customized yachts from the designers like Bruce Roberts. Closest to the airport, this marina is privately owned and has space for 600 boats. There are laundry, shower, electricity, and water facilities readily available to all who dock their boats here, as well as haul- out, launching, and dry-docking. This is not even to mention the repair and maintenance crews stationed close by. Unlike other marinas, Aktion has no problem with those who wish to live aboard their boats while docked. This marina is smaller than Aktion, with capacity for only 500 boats. There are many of the same services, however, including laundry, dry docking, maintenance, and repairs. Like Aktion, this is a privately managed marina, and is very secure. Each boat docked in this marina is supported with a steel cradle, made of purpose-built steel, and has full access to electricity, water, showers, toilets, free internet, and chandlery. The modern equipment and management style is the pride of Ionian Marina. 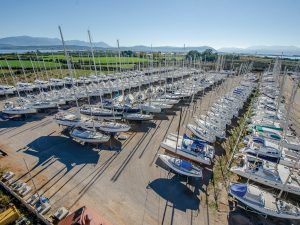 Located just 1.5 kilometers from the Aktion airport, and very close to Preveza, the Cleopatra Marina can accommodate 136 boats, up to 30 meters long and 8 meter draught. In the area, you can either dock or anchor, and all berths are equipped with power, water, and WiFi. Near the marina, a range of places to eat and stay, as well as shower, do laundry, or use the restroom. The fueling station has whatever lubricants you might need. Cleopatra has Greece’s largest dry docking facilities, including a travel lift that has a 300 ton capacity, and the most experienced and friendly staff in the area. The advanced technology available in the marina allows for the safest hoisting, launching, or storage of your yacht or boat. Under 24/7 security, you can feel safe either leaving your boat in the marina or while living aboard. The variety of boats for sale, particularly through yacht brokers in Greece like Williams & Smithells are extensive and names such as Feeling, Moody, Oyster, Northshore, Bowman, Wauquiez, Bavaria, Westerly, Beneteau, Jeanneau, Elan, Dehler are well represented as well as specialist custom cruising yachts from the boards of designers such as Bruce Roberts.